The education system in Pakistan lacks the ability to inculcate original thinking and creativity in the youth,” said Shehzad Ghias Sheikh, founder of Cogito, a theatre production company which is these days holding a youth performing arts festival in the city. Themed Speak Up; Act Now, the festival is being organised jointly by the Cogito, The Knowledge Factory (TKF) and local partners Talent Idols, Danka.pk and Dramducation with support from the US Consulate General. “In the absence of social platforms for people to express their creativity, such festivals help break shackles in the society,” said 24-year-old Sheikh, who has been teaching theatre since 2011. “This is so far the longest festival we have organised,” said Sheikh about the 11-day event which kicked off on January 11 at The Knowledge Factory in Defence Housing Authority. The Cogito had organised festivals of a similar kind in Karachi in 2010 and in Lahore in 2012. Sheikh said the previous festivals had lasted three days each. “We realised that smaller events are more successful,” he said. The festival this year includes workshops besides performances. Creative skills and arts were vital for any individual, especially the young, Sheikh said. Dedicated workshops are being organised on theatre production, acting, singing, music, fiction writing, kathak and improvisation. The previous festivals had hosted 600-700 people. The venue of this year’s festival accommodates 120 to 130 people, Sheikh said. TKF CEO Saad Tariq said they around 100 people were participating in the performances and 25 in workshops. He said as the event partners, they had employed social media to market it. There is no charge for participation except registration which the TKF administration says is mandatory. The festival is also hosting a “Lahore’s Got Talent” competition. The 2-day event is expected to be a highlight of the festival, Tariq said. Sheikh and his team will be visiting the Lahore Grammar School, the Lahore College of Arts and Sciences, the Lahore University of Management Sciences and the Mashal, a school for the underprivileged children at Charar Pind. He said the core team had 10 members. “We are not looking to bring about any ‘social change’ through the festival but aspire to achieve open communications through creative arts,” he said. “Working with young people is more productive than with adults as they are more receptive to new ideas,” he said. Sheikh held a workshop on improvisation on Saturday. He said it was more challenging to work with older people. “You need to make them feel ‘safe’ and provide them with an environment where they won’t be judged for trying something new,” he said. 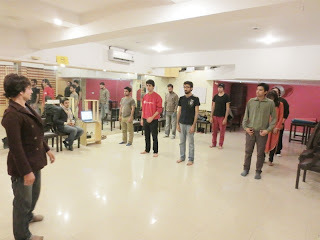 The workshops are held daily from 6pm to 8pm and performances till 10pm at TKF. A question of India’s honour?